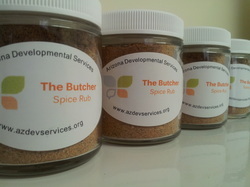 Rub a Dub Dub is our line of three different spice blends. They were created to add flavor and spice to your favorite foods. The Butcher, The Baker and The Candlestick Maker. The Butcher is a spice rub designed for meats, veggies and other savory items.The Candlestick Maker is a "HOT" version of The Butcher. The Baker is a spice blend for baked treats. All proceeds will go to Arizona Developmental Services in helping create a better experience for the young adults in our programs. This spice rub is perfect for marinades, rubs, dressings and more! The Butcher is a blend of dried herbs and spices to add that perfect flavor to your meats or other favorite foods. You can use as a rub for meats and veggies on the grill, smoker, oven and saute. A spicier version of The Butcher. Perfect for the meats or veggies your really want to "heat" up! Shipping will depend on amount purchased and shipping address. We accept payments thru PayPal. A spice blend for baking and other sweet treats. The Baker is a blend of and cinnamon, ginger, orange peel and other spices to add that perfect flavor to your breads, muffins and other baked favorites.